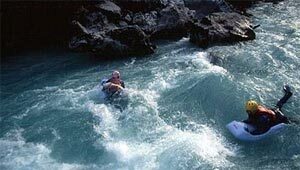 The challenge of holding your balance in the midst of speedy water is what river rafting is all about. And Pakistan, with a large network of rivers, is the place to be if you wish to enjoy the thrills of rafting. Originating from the great heights of the mountains, especially the great Karakoram, these rivers speed down in a way that makes you feel as if they are in a hurry to reach the plains and enjoy a long overdue freedom. Enroute they whirl, froth, foam and crash over rocky gorges and boulders. They make your raft wobble and wet you with an icy splash in an attempt to divert your attention. In brief, the rivers in Pakistan exude every bit of their untamed qualities and challenge you to overpower them. Also, they put to test your strength, both physical and mental, and it is in this that the whole excitement of rafting lies. The river rafting destinations in Pakistan are comparable to the best in the world. 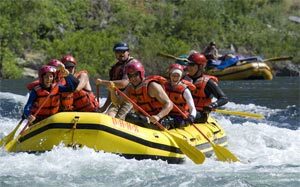 Also, very much like trekking, rafting in Pakistan offers different levels so that both amateurs as well as trained and professional rafters can enjoy themselves. Moreover, for those, in need of a bit of training, there are quick courses on offer too. The wild and roaring streams and rivers of the Northern Pakistan possess great potential for white and wild water sports. The rapids of these streams and rivers provide the ultimate adventure and thrill in mountain water sports and lend themselves to canoeing, Kayaking and white water rafting. The rivers of Pakistan are spread like a net through its length & breadth. Right from the heights of Karakorams. The Himalayas and the Hindukash, Pakistani revers change courses and flows until they all meet the mighty Indus, at different points which ulitmately falls into the Arabian Sea. These rivers are ideal for all kinds of water sports like rafting, canoeing, boating, & sailing. Pakistan offers a number of wonderful opportunities for white water rafting. The high rise mountain peaks on its northern side border Pakistan and these snow capped mountains and glaciers are what give birth to gurgling rivers that tumble down from the Karakoram, the Himalayas and the Hindukush to plains of Pakistan before meeting at the Arabian Sea. These rivers in the north of Pakistan offer wonderful opportunity for white water sports. Some of the rivers that make great white water sports spots in Pakistan are the Chitral, Indus, Gilgit, Swat, Hunza, Kunar and the Neelam river. You can enjoy river rafting, canoeing and kayaking in these rivers. The Indus, Ravi and Chenab in northern Pakistan provide wonderful opportunities for water sports. Some of the places that you can visit for water sports in Pakistan are from Naran to Kaghan on the Kunhar; from Dir to Batkhela on the Pankora; from Jaglot to Thakot on the Indus and from Aliabad to Gilgit on Hunza river. So if a streak with adventure is what you are looking forward on your holidays, Pakistan is a wonderful place to tour. Come and get wet on the rivers of Pakistan. Tour to Pakistan brings you complete information on various tourist destinations in Pakistan. Tour to Pakistan promises to offer you all the help to make your tour to Pakistan an exciting and memorable affair. If adventure sport is what you like come and take out adventure sports tours. For tour packages or hotel bookings in Pakistan, all you have to do is just fill up the form given below. Tour to Pakistan will get back to you.